Why Choose AWARE Soil Remediation Services? 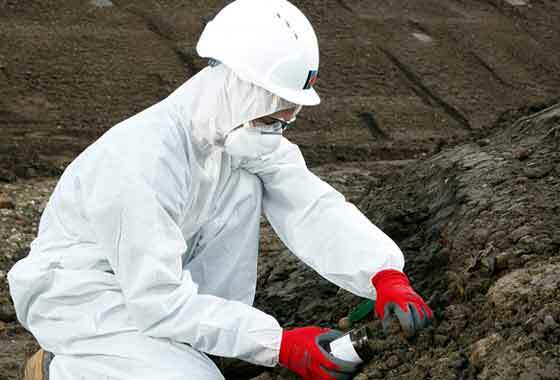 As one of the leading companies in soil remediation services, we have clients come to us for immediate solutions regarding soil contamination by asbestos, pesticides, petroleum hydrocarbons, chlorinated solvents, organic and inorganic pollutants (including persistent organic pollutants), and many other contaminants. Our state-of-the art equipment enables our professional team to perform small to large scale remediation projects efficiently, leaving behind soil that is clean, safe, and healthy for you and your family. Our system of soil remediation follows strict legislative requirements, providing you with site-specific as well as cost-effective solutions that are appropriate to your remediation requirements. Our track record of more than 80,000 tons of contaminated soil treatment throughout the years has made us among the experts in soil remediation services. Soil remediation is the application of several strategies aimed to purify and revitalize soil by reducing contaminants. Broadly known as environmental remediation, the cleansing process often involve soil extraction, disposal and, on certain occasions, purified soil replacement. Technological advancement has made it possible for soil remediation to be done within hours as opposed to weeks or months through conventional treatment. AWARE presents soil remediation solutions starting with a team of experts who visit your land for an on-site inspection to assess the degree of contamination in terms of land area and severity. Once the initial assessment is done, recommendations for reducing environmental impact of the contamination and improving the quality of soil on your site are suggested, all of which are tailored to your specific remediation needs. We offer in-site and off-site soil remediation services that target your specific soil contamination problems. Call AWARE now and ask for a quote. Our soil remediation experts are always available to provide you with on-site assessment as well as answer any questions you may have about our soil remediation services. We utilise our own EPA Licensed trucks to dispose of the Asbestos, which negates the need for large bins which may impact on your space. We are self supporting with respect to all of our equipment required to undertake the removal processes, which enables us to provide competitive pricing and quotes. All equipment and bins are removed from site after works completed, leaving you with a clean home. We are also happy to arrange other requirements to suit your needs including air pressure contamination control, replacement of roofing products, part or full demolition of garages, sheds, buildings, and we have a great professional relationship with a number of tradesman including carpenters, plumbers and electricians, that are able to provide an honest, competitively priced service. Our aim is to undertake our work in a safe, professional manner, and keep our clients satisfied, so that you will pass on our good work to your friends and associates. Our OH&S safety systems are updated and audited annually. Wherever you may be our residential asbestos removal is offered in Melbourne, Geelong, and other parts of Victoria. Regular safety audits and updates ensure our safety measures offer you the greatest protection. AWARE are one of the few companies offering ‘A Class’ asbestos removal services. Don’t trust your back yard to a back-yarder. Contact AWARE today. Home safety is too important to rely on inferior safety providers. Contact AWARE to ensure your safety.